In the case that the peghead surface of the neck blank is less than 3″ wide, put some ears on the peghead to make it a little wider. The ears are small pieces of wood that are the length of the peghead, the thickness of the peghead, and as wide you would like to make them. There is no need to add a lot of width to the peghead. Just add enough to make room for the peghead design you intend to use. I use the scrap I saved from the portion of the neck workpiece that I cut away when cutting out the side profile of the neck. It may be necessary to true one of the surfaces of this workpiece on the jointer so there will be a truly flat side to glue to the sides of the peghead. Cut the ears to the thickness of the peghead and glue them on the sides. It is likely that both the front and back sides of the peghead will have to be leveled after this step, so don’t worry if your ears are a tiny bit thicker, or thinner than the peghead or slightly misaligned. 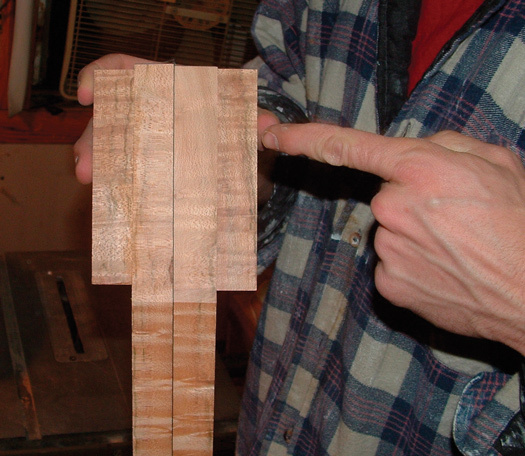 Cutting them as close as you can to the correct thickness will save work later. With most figured woods, it is difficult to see whether ears are used or not, they usually don’t stand out. I like to use them, as it is a practice which saves wood in the long run. This practice also allows me to begin with thinner stock, some of which is very beautiful. When the ears have been glued on, the peghead looks really big and bulky. It is usually necessary to level the peghead at this time. I usually do it with a sander, or a sanding plate but have also done it with a rasp and file. If you use a power sander for this operation, go slow and be very careful to keep the thickness consistent. The next job is the peghead overlay. The overlay is a thin piece of wood matching the fingerboard, rim cap, and heel cap. A peghead overlay is not an essential element of the banjo. They are usually used as an accent feature. If you do not intend to accent the rim cap, or the heel cap, there is no need to accent the peghead either. The peghead overlay may be left off entirely so long as the peghead is thick enough and you are satisfied with the look. I like to add accent features, so I’ll give some detail about the overlay. 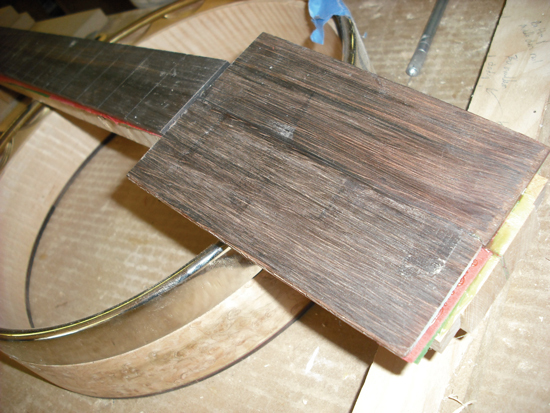 One end of the peghead overlay will almost meet the fingerboard. Bevel the edge of the overlay that will meet the fingerboard so that the angle on that edge runs 90 degrees to the plane of the fingerboard. 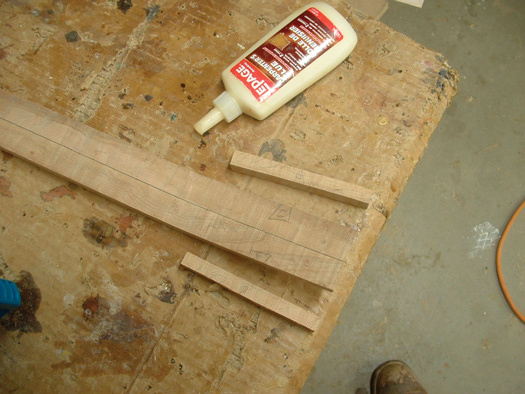 The overlay will be glued on right up to the place where the peghead breaks from the fingerboard plane. When the fingerboard is glued on, a small gap will be left between the overlay and the fingerboard. Later on this will hold the nut. This solution can be seen in the photo. The peghead overlay should be cut a little bigger than the pattern for the shape of the peghead and glued onto the peghead after the peghead has been leveled. Take care to center the overlay on the peghead. Use cauls to keep from marring the wood and spread the clamping pressure evenly, it’s a wide flat area so take care to get a positive bond all the way across. Mac drills 1/16″ holes in the scrap area and tacks on the overlay with small brads to keep it from shifting during gluing. The brads can be removed after positive clamping pressure is achieved. The peghead overlay glued in place. The neck blank with peghead overlay and fingerboard attached.